Pre-order this DVD now from Amazon for only $9.90! Ever since my girls started watching PBS Kids as preschoolers, they have been fans of the Wild Kratts. Not only did they find the show interesting and fun, but they have learned so much about different animals, all along the way. The Kratt brothers have a way of pulling viewers in to the show and making the feel like they are apart of the fun activities they go on. My girls love this show, and have a collection of Wild Kratts DVDs that they watch in the car. I also make a point to pull some episodes from the popular series when teaching the girls about animals, as I find they learn more and get excited about learning, thanks to the format of the show, and how the Kratt brothers relay information about the different animals they are tracking. 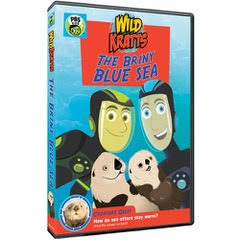 If your child loves aquatic animals, then they will love this new DVD. My girls agreed that their favorite of the four full-length episodes was the Sea Otter Swim episode. When you see Coach the otter, you can't help but fall in love with him. And, then when you see Coach teaching Jimmy how to swim, you can't help but wish this little sea otter was your own personal swimming tutor. We have only had this DVD for a few days, but, the girls have already watched it a handful of times. It is 105 minutes in length, which makes it perfect to bring along in the car for long car rides, or put on when your child is looking for something to watch and keep busy with. My girls will definitely be bringing this new Wild Kratts DVD in the car with them as we travel to see the live stage show, and then the museum exhibit in the coming weeks. With Easter fast approaching, this new DVD would also make for a great basket filler for that special Wild Kratts fan in your life. 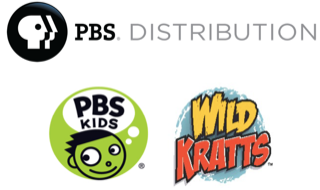 "PBS Distribution announces the upcoming release of the new DVD “WILD KRATTS: THE BRINY BLUE SEA” featuring four aquatic episodes from one of children’s favorite series on PBS KIDS, WILD KRATTS. “THE BRINY BLUE SEA” ($14.99 SRP) will be available on April 9, 2019 and has a run time of approximately 105 minutes. Episodes featured on this DVD will also be streaming on PBS KIDS Prime Channel.